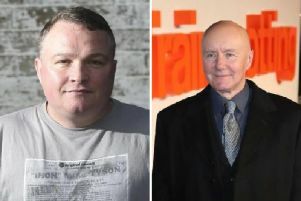 Outlander and River City actor Tam Dean Burn says he is “fine” after he was stabbed on the Royal Mile in Edinburgh. The 60-year-old left an event at the Scottish Poetry Library on Saturday afternoon and was heading to a football game when he was assaulted. He was treated in hospital following the terrifying incident. Last night the actor wrote on social media site Twitter to thank well-wishers following the attack.